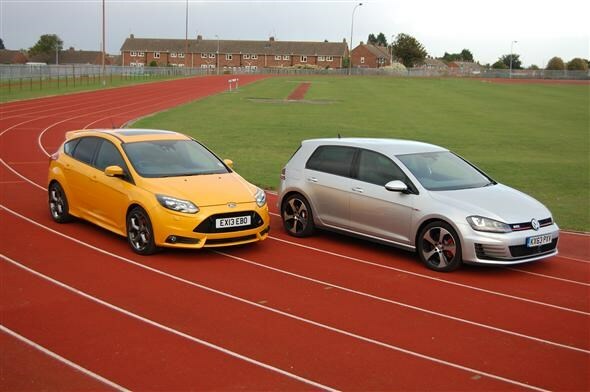 Hot hatches – which is the better used buy? When the hot hatch heyday was dawning back in the early 1980s, an entry-level Ferrari mustered 215hp. 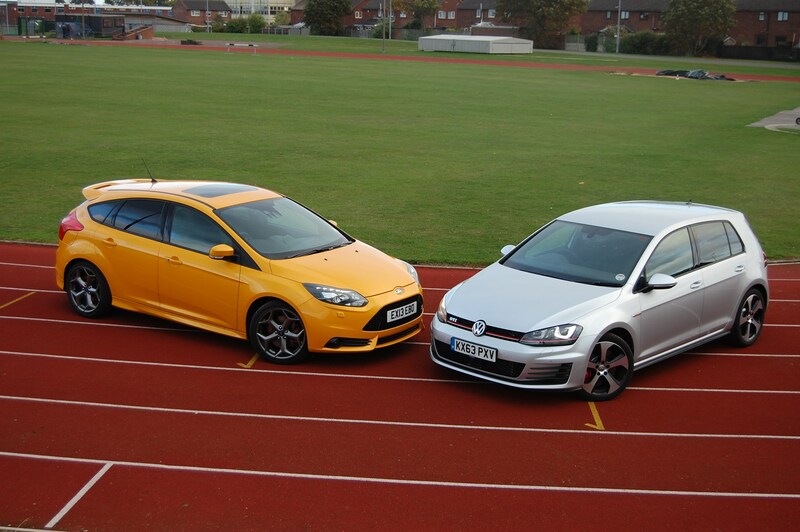 This pair has 474hp between them, but which is the better used car? They say power corrupts and in the Focus’ case it’s true. Under the bonnet barks a 2.0-litre turbocharged engine with an exhaust note that wouldn’t sound out of place on a track. The problem lies in the over-delivery of 250hp to the front wheels. Tease the accelerator with anything heavier than a deftly applied right foot and the wheels scrabble for adhesion. Add a wet surface or steering angle into the mix and the experience is frenzied, the wheel being tugged left and right in your hands. The Golf – with optional Performance Pack - might have 20hp more, but controls its traction far better. You can still spin the wheels under very hard acceleration, but in most conditions it remains true to the steering direction. Its secret’s a limited slip differential – technology which stops the inside front wheel rotating as fast through corners, thus reducing wheel-spin. Less spin equals more traction, ergo it’s quicker. The stats say the GTI reaches 60mph in 6.4 seconds, which is 0.1 seconds quicker than the ST, but the gap feels larger in real life as there’s more usable power. Ultimately, there’s less feel through the GTI’s chunky steering wheel, but it’s easier to have faith in its behaviour and consequently you drive it quicker and more confidently. Both have well-weighted controls, reflecting the meatier performance on offer, but the engineering integrity feels superior in the Golf. Take the brakes: both reduce speed quickly, but the GTI Performance Pack’s larger front discs provide prodigious, straight stopping power. Yet another confidence boost. 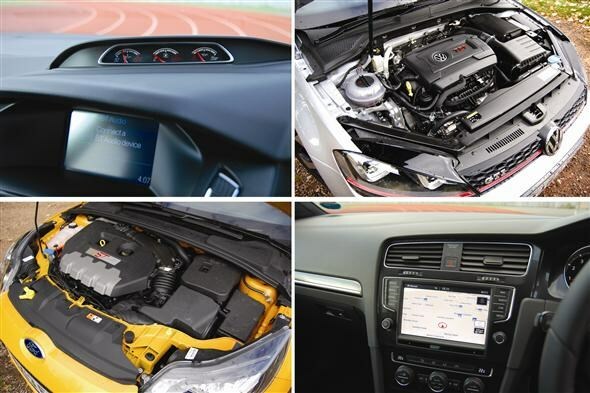 Climb inside the Golf and what it lacks in creative fervour it makes up for in impeccable construction and usability. 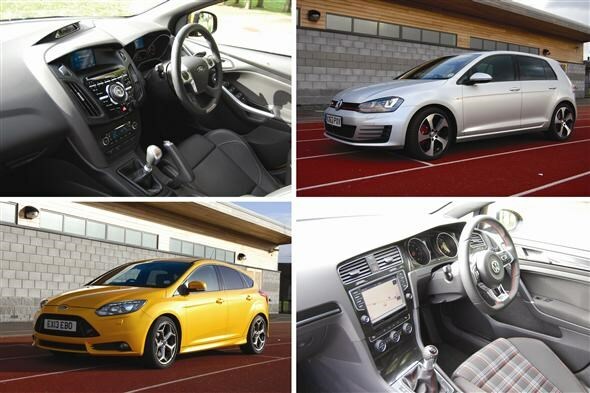 Familiar GTI cues like the tartan upholstery, golf ball gear knob and red detailing look classy rather than clichéd. There’s little to lift the Focus’ cabin, which looks haphazard next to the Golf’s, but it’s nonetheless straightforward. Black leather Recaro sports seats on the ST-3 are one of few highlights. Even the dash-top mounted trio of additional dials look like an afterthought. It’s a different story outside, especially with the ST’s optional ‘Tangerine Scream’ paint job. Colour aside, it’s bedecked with skirts and spoilers, whereas the GTI is the epitome of sporty elegance. Both hatchbacks have unique front ends to differentiate them from their lesser brethren, but the Ford’s gaping grille looks overdone compared to the Volkswagen’s discreet fins and scarlet stripe that continues through the headlights. Hot hatches perform a dual role of course, and although the Golf’s more compact outside, it offers superior interior space. 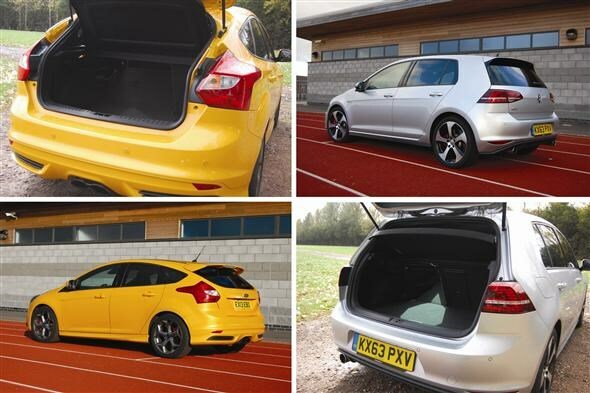 The boot’s usefully larger boot too, (380 litres with the seats up versus the Focus’ 316), and it scores for practicality over the Ford due to its flat-folding rear seats. Buying a Golf is straightforward – there are lots of used examples out there, and you're spoilt for trim, equipment and power options. 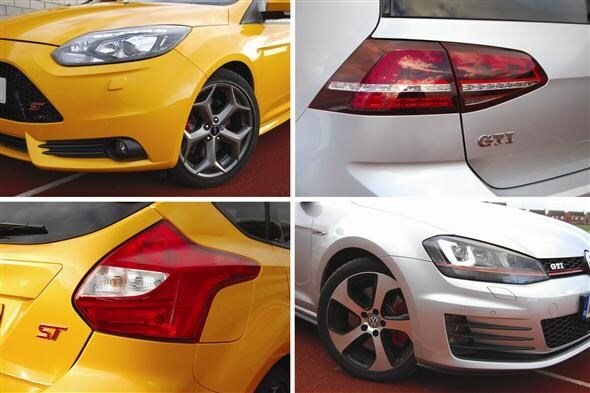 The Focus is less common, and has a less extensive range of cars on offer – so you'll need to search harder. The Golf is cheaper to fuel and tax than the Focus. 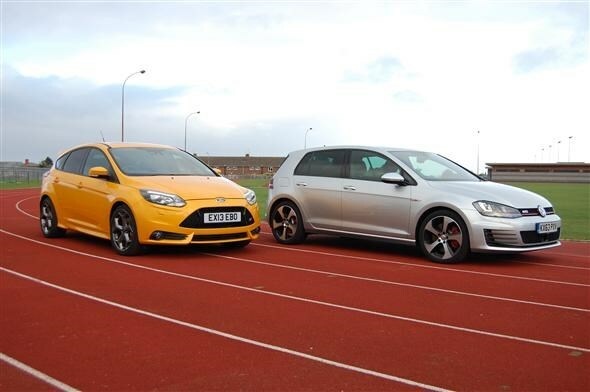 Official fuel consumption claims have the GTI on 47.1mpg and the ST at 39.2mpg. After several hundred miles of driving in a variety of conditions we managed 34mpg and 28mpg respectively. Factor in the Golf’s 139g/km CO2 road tax band E rating against the Focus’ dirtier 169g/km score, placing the Ford in pricier band H, and the picture’s clearer still. The Ford will also be cheaper to service and maintain, although specialist support for both is plentiful, and would reduce costs usefully once you leave the main dealer network. 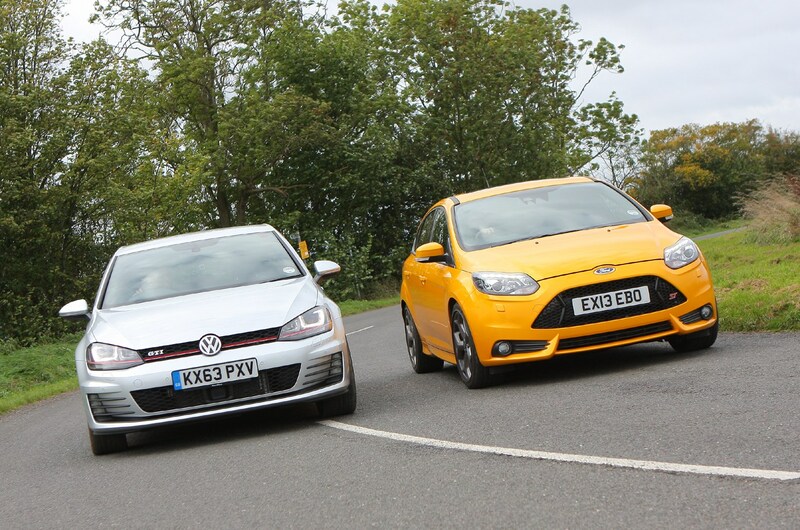 Deciding between the two should be easy: the Golf GTI stands head and shoulders above the Focus ST. It feels better engineered, provides greater refinement and enjoys a more premium driving environment – and ultimately, it will be easier to live with. It’s a demonstrably quicker weapon for covering significant mileage, whether pounding along featureless motorways or winding B-roads. The Performance Pack’s limited slip differential enables it to power commandingly out of bends. There is a ‘but’, though. There is an assumption that larger hot hatch customers have matured and drivers want a quick five-seater that’s suitably more grown up. 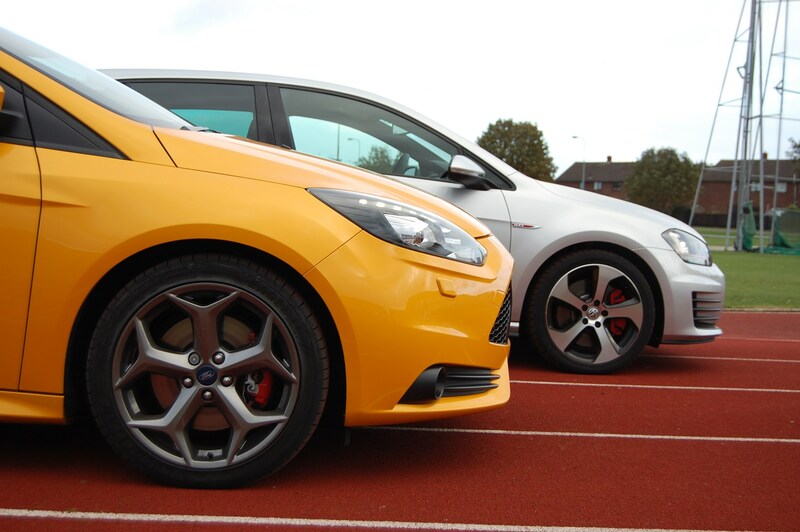 If you like your hot hatches lairy regardless of size, the ST might be the one to plough your hard earned into. 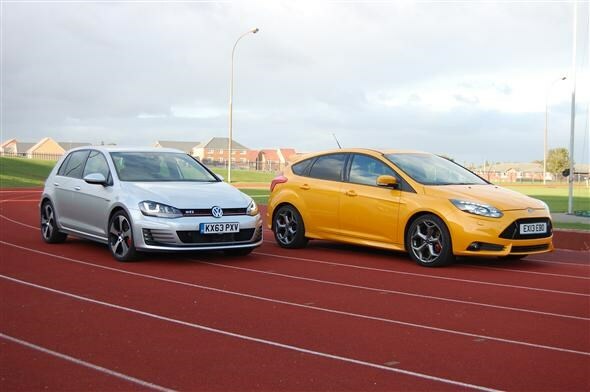 In our test, however, the Golf GTI wins, but the Focus ST is a rumbustuous runner up for those who haven't quite grown up yet. We'd also add that at the time of writing (Jaunary 2019), good used examples of the Ford Focus are significantly cheaper – around £3,000 for similarly storied examples. That for us, makes this a tougher used car decision than we'd have thought it would.